Hugh Jackman is out chasing Oscars in all the wrong places. This film screams awards season and yet is nowhere to be seen on the lists so far this year and it's not because the movie is bad, in fact it has wonderful direction from Jason Reitman who is receiving success elsewhere with his insightful exploration of motherhood in his earlier 2018 release Tully. The Front Runner even has thoughtful performances from Hugh Jackman himself and Vera Farmiga who plays Lee Hart, Gary's wife. Mamoudou Athie arguably gives the best performance of all in AJ Parker, an admirer of Gary Hart but also a member of the media who is stuck between the conflict of his job and what is morally right. The film would've been better told through his perspective. 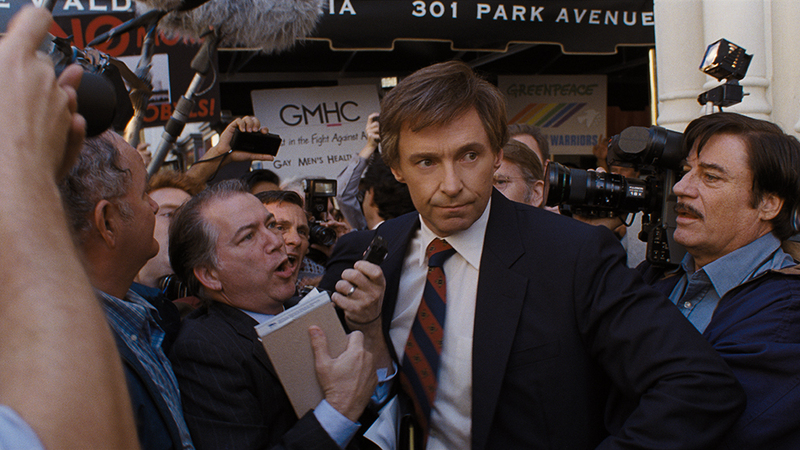 If you need a little run down on what The Front Runner is about it follows Gary Hart who was ahead in the race for presidency at the 1988 US election until his campaign came crashing down in its final three weeks after he was spotted sneaking around with a woman named Donna Rice. The affair is pretty ambiguous and never fully gets explored which leads me to question why this film needed to be made. "The Media" is its own character in this movie. There's social commentary all over the place with subtle jabs at Trump, as most films are doing nowadays, and it has a recipe for success as its themes are topical and important but the characters are never explored deep enough for me to even care about what the outcome of the race is. I was unsure of who I was being positioned to like and it was due to the ensemble cast with Jackman at the heart. The affair was pretty ambiguously alluded to and never once did we see him really doing anything other than walking out of a house with her. There were one or two short scenes of the two of them together but we didn't get to see a relationship build or develop and therefore we, as an audience, cannot connect to what Gary Hart is going through, he just seems like another powerful man with nothing better to do with his time. The narrative is popular and has been done better in other films which leads me to question whether the newsroom characters in J. K. Simmons et al were meant to be our protagonists but I didn't feel sorry for them either, hiding in the bushes and jumping a man in the street with no real evidence of what they were accusing him of. It misses its mark in multiple ways and if Reitman's angle on the film was to position us as the general public then the newsroom angle should've been pursued harder and if he wanted us to be outraged by the aggressiveness of the media then we needed to see Gary going through it and the knock on effect it had to his family. It felt like there was a real attempt to get the balance between the two but it just left us with a real neutral angle on the argument. The film was shot beautifully and the quiet moments were nurtured with intricate direction but I wish there was a harder angle on a topic that would outrage us as much as it was intended to. The Front Runner hits UK cinemas 11th January 2019.